Huawei is no doubt doing great in the Smartphone market but one of their latest launched Huawei P9 is struggling hard. 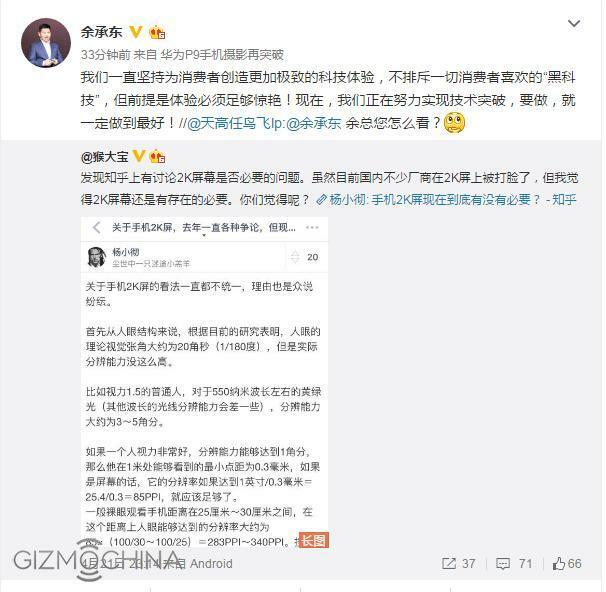 On top of that the CEO of Huawei, Yu Chengdong surprises with a post in Weibo saying that the new Huawei flagship phone will come with 2K Display. Having 2k Display ensures that the next Huawei phone will give a better processor. One bigger challenge here is the battery. The phone should come loaded with better mAh battery to ensure long lasting usability. Also we are expecting this smartphone to come along with the VR. As, Huawei has already announced the VR headset, so we can expect this too. We do are excited to see this upcoming Huawei QHD smartphone and at the same time we might see few other manufacturers to take the same step. Apart from this we can only predict the specification. It can come with an 18MP camera and a Snapdragon 820 processor.